A special relationship between God and his people was created with Abraham and Moses. This relationship was two-way. God would look after and guide his people. God’s people would listen to and obey certain ‘laws’. The first 5 books of the Old Testament (Genesis, Exodus, Leviticus, Numbers, Deuteronomy) express what is required by both parties to live this ‘Covenant’. Todays reading explores the ‘covenant code’ and what social behaviours are required by God. Aliens (foreigners), widows and orphans have no protection of family or friends. But God loves them. We are to love, include and provide for them. Who are the equivalent of aliens, widows and orphans today? Are you living in ‘covenant-love’ with them? Jewish people were not to demand interest. They developed the practice of a ‘pledge’ to ensure repayment. As a safe-guard God stated a poor person was not to go cold at night without his ‘cloak’. Certain measures were in place to protect the dignity of the poor. How could you relate this to today? Paul continues his praise of the community of Thessalonika. Despite Paul and the other teachers being forced to leave them because of persecution, their ‘imitation of them’ and ‘the word of the Lord sounding forth’ from them to other communities showed such courage and faith. Have you ever had someone inspirational leave you and yet you decided to ‘continue their example’? Who has done this for your faith journey? What happened? Jesus is again forced into an argument with religious leaders. 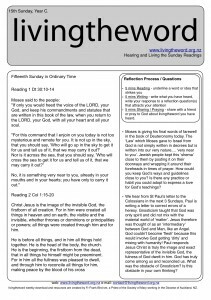 Pharisees decide to attack Jesus’ knowledge of the ‘Laws’. Jewish people had summarised all the laws of the first 5 books of the Old Testament into 613 laws. All were to be observed. Some were interpreted as ‘heavy – very important’ and some were thought of as ‘light – not as important’. Surprisingly, Jesus took a heavy law and and a light law and said they were intimately linked. Love God AND Neighbour. Jewish people interpreted ‘neighbour’ as fellow Israelites. Jesus’ teaching pushed ‘neighbour’ to include everyone. Everyone is to be treated as belonging to ‘yourself’ – as family! How does your love get ‘limited’? Why? Who gets excluded? Can you glimpse the heart of the gospel in this brief statement? A common criticism of the prophets in the Old Testament was that love of God was celebrated in the temple with sacrifices and gifts – Sunday worship. But it stopped there! They cried: what God wants is ‘mercy, not sacrifices’. Christianity is not lived on Sunday alone. How could you show more clearly a Sunday AND Monday discipleship?